What’s worse, they may face greater stigmas if they seek treatment. Maybe you’re struggling with substance abuse and don’t know where to turn. Perhaps you’ve noticed a loved one or friend with a problem. Officials of the armed services are definitely concerned, as they state in this January 2019 news story from CNN, which reported “confirmed and suspected suicides in active-duty Marine Corps and the Navy reached a 10-year high in 2018.” The National Center for PTSD links substance abuse disorder (SUD) and PTSD, stating that “more than 2 of 10 veterans with PTSD also have SUD.” A recent study points to the rise of drunk driving by veterans: up 65 percent since 2014. Additional studies suspect a strong correlation between mental health problems, substance abuse, and suicide risk. So it’s possible many of the stigmas involving SUD treatment and how the process works may be insular to military attitudes, creating a barrier and causing more harm than good. It’s easy to not be aware of all potential opportunities for care, especially when trapped by emotions or thoughts that threaten your or a loved one’s wellbeing. Here’s a list of agencies and organizations that help veterans struggling with drug or alcohol abuse. The Department of Veterans Affairs (VA)—it seems obvious there would be assistance available here, but the depth of aid is quite extensive. In addition to the main site under the substance use programs and services tab, here are some other key resources to navigate. The Veteran’s Crisis Line is free, confidential, 24/7 support staffed by qualified responders—many of whom are veterans as well—that serves all vets, armed services active members, National Guard and Reserve, and family members and friends. The AboutFace PTSD site is a collective of individuals sharing their stories for relatability and to reduce the stigma of the condition. This site also features interactive components to use in order to assess need, understand the symptoms, and seek out treatment options. VetChange is an app-based program for veterans and active duty members to use self-help tools to help them decide if they need to change drinking behaviors. There are other apps similar to this, providing lifestyle techniques for aspects such as stress management, mindfulness, family coaching, anger management, and in-therapy benchmark guidelines, among others. Make the Connection is another peer-based site that shares hundreds of stories from vets and active service personnel who’ve identified their substance abuse or mental health issues, followed-through on effective treatment, and came out on the other side healthier and happier. You can even filter the stories by service, branch, combat experience, and gender for better relatability, and take a self-assessment to gauge the level of difficulty you may be experiencing. The site also addresses other topics such as homelessness, coming out, financial and legal issues, spirituality, and transitioning from service. 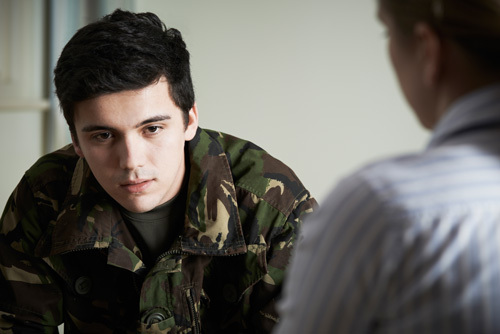 Military Sexual Trauma resources are available through the VA’s mental health tab, and provide qualitative information and follow-up actions. Substance Use Disorder Program Locator is a service that identifies specific VA medical centers that offer SUD treatment programs. Even if there isn’t a specific program at a center, these centers still offer SUD treatment. You can click on a state—say, Georgia—and the locator lists all medical facilities with options, often tied to PTSD programs. Women Veterans Health Care features a call center with access to female support staff members who can walk you or family members through a variety of care options. Caregiver Support Services are also available through the VA for a variety of circumstances. Many resource organizations may be state-specific. For example, in 2017, the AJC printed a story featuring a number of agencies and programs that help Georgia vets. Even though the VA offers extensive assistance to veterans struggling with SUD, PTSD, or suicidal thoughts, many members of the armed forces and their loved ones feel they won’t get help soon enough. Private rehabilitation may be the answer to the continuation of your courageous life. At Twin Lakes Recovery Center, we have admissions staff available 24/7 to take your call immediately. You have nothing to prove and everything to gain. To learn more about our detox and treatment programs at Twin Lakes, Atlanta area residential treatment centers, please use the convenient contact form.